Home PAGASA PAGASA Weather Update for new LPA as of 4:00 PM 20 September 2018. PAGASA Weather Update for new LPA as of 4:00 PM 20 September 2018. Location: LPA at 3:00 PM 2,245 km ENE of Mindanao (Hinatuan, Surigao del Sur) (11.9N, 149.5E). Shallow Low Pressure Area is also spotted near Palawan but is expected not to intensify. 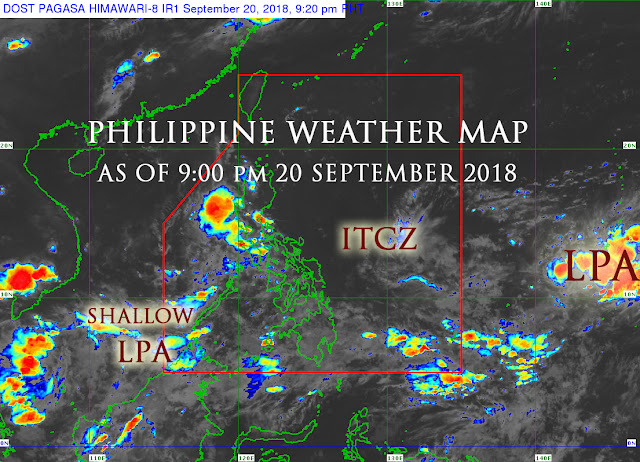 Intertropical Convergence Zone (ITCZ) affecting Southern Luzon and Visayas and Mindanao. What's more about this new LPA? Expected to develop into TD within 24-48 hours. Possible Forecast track extreme Northern Luzon. *Note: Long range forecast may likely change. All are advisesd to continue monitoring for updates given by PAGASA. Weather information is courtesy of DOST PAGASA & Weather Specialist: Gener Quitlong.